It’s beginning to look like Hollywood has already squeezed the life out of 3D. As we’ve been predicting for months now, people are starting to seek out 2D options instead. That’s no easy thing these days, when all the best screens in any given movie theater are devoted entirely to showing 3D movies. But it’s happening. Audiences are revolting and The Wrap has proof. The really disturbing thing here, if you’re a Hollywood studio rushing all your future offerings into the 3D format, is that while the percentage of 3D revenue has decreased the number of theaters making it available has steadly increased. If that were put on a separate graph, you’d see a red line running in the opposite direction. So while theater owners ramp up to deliver more 3D screens, audiences are going the other direction and seeking out 2D showings even when in many areas it is now probably easier to see a Toy Story 3 in 3D than it is to find it in 2D. 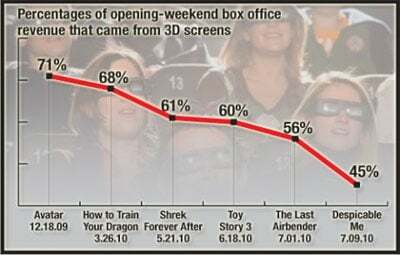 Worst of all, 3D now occupies all the best screens. So if you’re one of the 40% of people who made it a point to see Toy Story 3 in 2D, you were forced to see it on a smaller screen with an inferior projector. Theater owners are basically forcing people to watch movies in a less than optimal setting, and that’s probably not a great move if you’re hoping for return customers. So why the revolt? The reasons are obvious and we’ve outlined them in depth here. It ruins the picture by making it dimmer, it makes people sick, they’re overcharging for it… the list goes on. Hollywood’s squeezed all the money it can out of 3D. By the time 2011’s crop of 3D offerings like Green Hornet finally hit theaters, right now the trend seems to indicate that no one will be left who wants to pay to see it. My guess it that Hollywood hopes this trend is the result of damage done to the market by inferior 3D products like Clash of the Titans. That could be why the most recent Resident Evil: Afterlife trailer makes it a point to advertise itself as “filmed in 3D”, hoping to separate itself from slapdash conversions. But even the best 3D products still suffer from numerous problems and, there’s the ticket prices, which show no sign of going lower. Audiences are tired of paying extra for something which at best really doesn’t make most movies better and at worst may literally make them want to vomit. Keep buying those 2D tickets and maybe we’ll take back the movie theaters.